WBS is a tool that used by Business Analyst in order to plan business analysis activities. Today I will share about some great articles about it from workbreakstructure.com and tutorialspoint.com. As far as I read, I found that this WBS is also used by Project Manager. I think both BA and PM should collaborate to create a great WBS. This post is just an overview, maybe I will update about this later. Dividing complex projects to simpler and manageable tasks is the process identified as Work Breakdown Structure (WBS). Usually, the project managers use this method for simplifying the project execution. In WBS, much larger tasks are broken down to manageable chunks of work. These chunks can be easily supervised and estimated. WBS is not restricted to a specific field when it come to application. This methodology can be used for any type of project management. Accurate and readable project organization. Accurate assignment of responsibilities to the project team. Indicated the project milestones and control points. Helps to estimate the cost, time and risk. Illustrate the project scope, so the stakeholders can have better understanding of the same. Identifying the main deliverables of a project is the starting point for deriving a work breakdown structure. This important step is usually done by the PM and the SME involved in the project. Once this step is completed, the SME start breaking down the high-level tasks into smaller chuncks of work. In the process of breaking down the tasks, one can break them down into different levels of detail. One can detail a high-level task into ten sub-tasks while another can detail the same high-level task into 20 sub-tasks. Therefore, there is no hard and fast rule on how you should breakdown a task in WBS. Rather, the level of breakdown is a matter of the project type and the management style followed for the project. In general, there are a few "rules" used for determining the smallest task chunk. In "two weeks" rule, nothing is broken down smaller than two weeks worth of work. This means, the smallest task of the WBS is at least two-week long. 8/80 is another rule used when creating a WBS. This rule implies that no task should be smaller than 8 hours of work and should not be larger than 80 hours of work. One can use many forms to display their WBS. 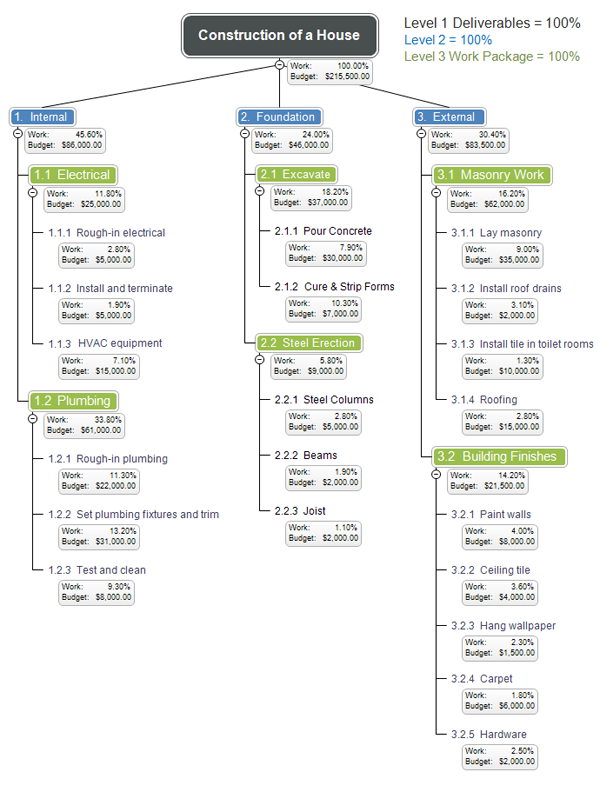 Some use tree structure to illustrate the WBS, while others use lists and tables. Outlining is one of the easiest ways of representing a WBS. In a WBS diagram, the project scope is graphically expressed. Usually the diagram starts with a graphic object or a box at the top, which represents the entire project. Then, there are sub-components under the box. These boxes represent the deliverables of the project. Under each deliverable, there are sub-elements listed. These sub-elements are the activities that should be performed in order to achieve the deliverables. Although most of the WBS diagrams are designed based on the deliveries, some WBS are created based on the project phases. Usually, information technology projects are perfectly fit into WBS model. Therefore, almost all information technology projects make use of WBS. In addition to the general use of WBS, there is specific objective for deriving a WBS as well. WBS is the input for Gantt charts, a tool that is used for project management purpose. Gantt chart is used for tracking the progression of the tasks derived by WBS. The efficiency of a work breakdown structure can determine the success of a project. 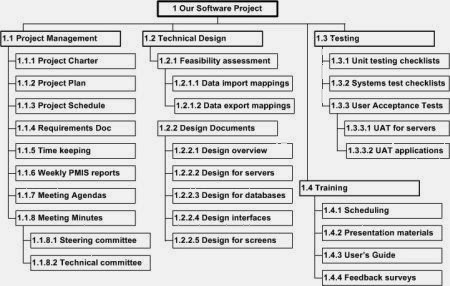 A work breakdown structure is a key project deliverable that organizes the team's work into manageable sections. The Project Management Body of Knowledge (PMBOK) defines the work breakdown structure as a "deliverable oriented hierarchical decomposition of the work to be executed by the project team." The work breakdown structure visually defines the scope into manageable chunks that a project team can understand, as each level of the work breakdown structure provides further definition and detail. #Why use a Work Breakdown Structure? The work breakdown structure has a number of benefits in addition to defining and organizing the project work. A project budget can be allocated to the top levels of the work breakdown structure, and department budgets can be quickly calculated based on the each project's work breakdown structure. By allocating time and cost estimates to specific sections of the work breakdown structure, a project schedule and budget can be quickly developed. As the project executes, specific sections of the work breakdown structure can be tracked to identify project cost performance and identify issues and problem areas in the project organization. For more information about Time allocation, see the 100% Rule. Project work breakdown structures can also be used to identify potential risks in a given project. If a work breakdown structure has a branch that is not well defined then it represents a scope definition risk. These risks should be tracked in a project log and reviewed as the project executes. By integrating the work breakdown structure with an organizational breakdown structure, the project manager can also identify communication points and formulate a communication plan across the project organization. When a project is falling behind, referring the work breakdown structure will quickly identify the major deliverables impacted by a failing work package or late sub- deliverable. The work breakdown structure can also be color coded to represent sub- deliverable status. Assigning colors of red for late, yellow for at risk, green for on-target, and blue for completed deliverables is an effective way to produce a heat-map of project progress and draw management's attention to key areas of the work breakdown structure.